Reigning East of Scotland League champions Lothian Thistle Hutchison Vale saw off a plucky Coldstream side 2-1 to make it ten wins from ten league games this season. After a goalless first half at Home Park, Louis Swanson steered Raymond Carr’s men ahead seven minutes after the restart. Former Spartans striker and recent signing Keith Murray doubled the Capital side’s lead with just ten minutes left on the clock. However, Kris Dixon’s penalty set up a nervy finish in the Borders but Lothian’s defence stood firm to see out the game. The Saughton-based side are 18 points adrift of current league leaders Kelty Hearts in fourth – however, they do have six games in hand. Tynecastle couldn’t do their ground-sharing rivals a favour as they fell to a 5-0 defeat to Kelty, Ross Philp’s brace, Stuart Cargill, Neil McCabe and Jordyn Sheerin all breaching the visitors’ defence at New Central Park. Meanwhile, Anton Dowds gave Heriot-Watt University the lead at the Pennypit only for Gavin Stevenson to equalise midway through the second half to earn hosts Preston Athletic a point. 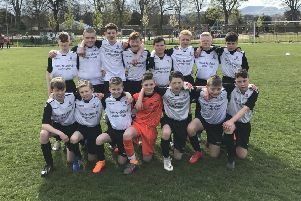 Sonny Swanson’s late strike handed Leith Athletic a hard-fought 2-1 victory over Peebles Rovers at Peffermill and Ormiston and Stirling University played out a goalless draw at Hibs’ East Mains Training Centre.